Well ladies, only one more week to go after this one. I am NOWHERE near where I wanted to be at this point. Nope. Not even close. I didn’t exercise. My excuse will be that it rained the majority of the mornings, but that’s just an excuse. My other excuse could be that I’m too busy, but that’s just an excuse. I didn’t count calories. I ate french fries. I ate desserts. I pretty much did whatever I wanted. Shocker – I gained a pound back. Of course. You can’t behave badly without consequences! So, I have one week left of this challenge. One week to treat my body like the temple it is. One week to get my booty back in gear. *sigh* Praying to find the motivation. Seriously! Realizing (once again) that I can’t do this on my own. That I need to soak myself in God’s word and allow Him to take the burden of this. And, when He wakes me up at 5 to actually get out of the bed and WALK rather than lay there and try to go back to sleep. So, how did you do this week? I hope you did better than me! I can’t wait to see who wins the prize next week! This week was another stagnant one. No movement on the weight front. Oh, it might be the boxes of Lucky Charms I bought so I could get the box tops and have proceeded to eat at an alarming rate. Or, it could be the fact that I didn’t walk every day. Or, it could be that I’m not recording what I eat. So, can next week be a better week. Oh yes it can! Good morning Losing It! ladies! I hope you are having a better week than I am. Well, I’m still walking most days, but the eating thing. Totally out of control. I’m a stress eater. And an emotional eater. I’ve been both lately – stressed and emotional. They kind of go together don’t they? I didn’t gain any weight, but I didn’t lose any either. I did walk most days, but it was like pulling teeth to get myself out of bed. I will give the excuse/reason that Aunt Flo was visiting me this week. Her visits leave me drained. I always need more sleep. How did you guys do this week? I can’t wait to hear. I’ve seen lots of exercising and calorie burning numbers on Twitter. So proud of all of you. Really I am! Well ladies, another week down. I know some of you are having great weeks, and I can’t wait to read all about them. I am impressed daily by how hard you are all working on taking better care of your bodies. Well, I had an okay week. Lost back the pound I had gained last week. So, that’s a bonus. I’m exercising regularly, but still not eating as well as I need to be. It’s lunch that seems to do me in so I need to really focus in on that meal. I need to be better prepared… more intentional. Lose 2 pounds Lost the one back that I had gained…so, doesn’t feel like I really did anything. Exercise 6 times I did 5, which is better than 4, but not as good as 6. Drink nothing but water and 1 glass of tea a day This is getting better. Lots of water this week. Log my calories into My Fitness Pal daily (and DON’T go over) Don’t think I did that one day. Which would be why I’m not doing well with the eating. Encourage the #LosingIt11 gals better on Twitter This I think I’m good at. Begin the day with prayer for help with my eating choices. Need to be more intentional about this. I’ve got the same goals going into next week. I’m praying that I can find some motivation somewhere! I truly don’t want to talk about it. But, I shall for you my fellow losing it gals. Ate french fries – twice. Didn’t drink enough water 3 days. I can do this. I just need to focus. And not be so stressed. And be more purposeful about packing snacks. And focus. Did I mention the focus? Well friends, we are half way there!!! Half way through this Losing It! competition. Only six more weeks to go. Are you where you wanted to be half way through? I’ve lost some weight, but not half of the 15 pounds I’d hoped to lose during this competition. Not even close to those 7.5 pounds. That is rather disappointing. What can you do to punch it up? Don’t lose your motivation!! This is a life change ladies. Let’s do it! Lose 2 pounds Lost 1. Slow and steady…. Drink nothing but water and 1 glass of tea a day This was good some days and bad others. Still no soda though. Log my calories into My Fitness Pal daily (and DON’T go over)NOT doing well with this at all. 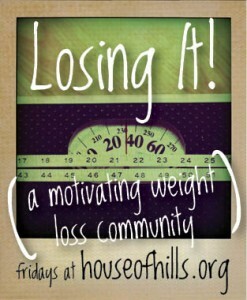 Encourage the #LosingIt11 gals better on Twitter This is so fun! Love seeing everyone give each other encouragement. Begin the day with prayer for help with my eating choices.Love my God. So, how did you do? Link up so we can go cheer you on! Good morning my Losing It! friends! This is going to be a quick post because I have a packed day and need to walk out the door in 27 minutes. And, I still stink from my morning walk! Please note that My Sweetie made me a new button (to the left) with the correct web address on it. Ya, the old button we’d been using was the old web address. Bad blogger. So, big shout out to my geeky sweetie! Lose 2 pounds Nope. But lost 1 – so that’s good. Drink nothing but water and 1 glass of tea a day Still struggling with too much tea some days. Always feel better when drink more water. Log my calories into My Fitness Pal daily (and DON’T go over) I did TERRIBLE with this this week. I don’t think I went too over, but I hardly logged in at all. Bad girl. Encourage the #LosingIt11 gals better on Twitter Feel GOOD about this one. Begin the day with prayer for help with my eating choices. Most days. Life is better when I do! How did you do this week! It was GREAT chatting with you guys more on Twitter this week. I love the mutual support. I really want to try and do more and more of that. I love seeing you talk to each other too. So fun! We are fighting a lovely virus at the House of Hills right now. Well, by “we” I mean the Princess. The poor thing has sores all in her throat. We are so thankful they have not moved into her mouth, but still she is highly contagious. That means that I’m highly contagious since I hold her and love on her no matter what. That also means my Sweetie is doing his best to stay very far away from us. I’m kinda missing him. Lose 2 pounds Nope. But I didn’t gain any either. Exercise 6 times Nope. See above for my excuse reason. Drink nothing but water and 1 glass of tea a day Better this week. Still need to drink less tea. Log my calories into My Fitness Pal daily (and DON’T go over) Five out of seven days. 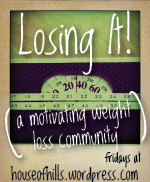 Encourage the #LosingIt11 gals better on Twitter Yep! At least I think so. Begin the day with prayer for help with my eating choices. Yep! I love time with my heavenly Father. I’m keeping the same goals for next week. One week I’ll get them all! So, how about you guys. I saw some real work on Twitter this week. I can’t wait to hear how everyone is doing!! How was your week ladies!? Were you able to stick to your goals? Did you get your water in? For those of you just joining us, we are in the middle of a Losing it Challenge! There is still time to join us if you want. We’d love to have you. I was slightly frustrated that I only lost half a pound this week. Then I started thinking of why this might be and came up with the following reasons. I have gained A LOT of muscle mass in the last two weeks. My morning walk is not nearly as “hard” as it was in the beginning. I ate the right amount of calories, but I didn’t eat good calories. I had WAY too much sodium this week. Again, not good food choices. I didn’t get enough water in at the end of the week. These are all reasons that I might not have lost weight, but I can’t let them be excuses. I NEED to make better eating choices. I NEED to get my water in. It’s my responsibility. MINE. Nobody can do it for me. However, even though it’s my responsibility, I can always ask for help. I can ask friends and family to help. And, most importantly, I can ask my heavenly Father for help. I’m not trusting Him to help me, and that is obvious. Begin the day with prayer for help with my eating choices. What are you goals for this next week? Or, are you making daily goals like some of our participants are? I can’t wait to hear how everyone did! So! How are you doing? Did you reach your goals this week? Did you do better than your goals? I will say that the fact that I was going to have to write this post this week helped me in SO MANY WAYS! Like seriously. I LOVE the whole accountability thing. I hope it’s helping some of you too. If you don’t know what’s going on, I’ll fill you in. We’re having a little contest here at the House of Hills. We’re Losing It! The contest is for 12 weeks. Today is the start of week 2 . You must write a post and link up for 9 of the 12 weeks to be considered participating. If you don’t have a blog, that’s okay! You just need to comment at least nine weeks to let us know how you’re doing. The participant who loses the largest percentage of weight at the end of the 12 weeks is the winner. You don’t have to tell us actual numbers, just the percentage. $30 Gift Card to Amazon to purchase something to help them on their weight loss journey. A copy of Cook This, Not That! Easy & Awesome 350-Calorie Meals , a book I’m enjoying on my weight loss journey. How did you do this week? I’ll go first. Lose 3 pounds I lost 2 pounds. Slightly bummed, but that’s okay. Exercise 5 times (it’s a long weekend) I exercised 6 times! Whoop! Drink nothing but water and 1 glass of tea a day. I did pretty good on this one. I had nothing but water and tea, but sometimes too much tea. Log my calories into My Fitness Pal daily (and try not to don’t go over) I DID log daily. I DID go over a couple of days, but never by more than 100 calories, which is HUGE for me. All in all, I’m pretty pleased with the week. Do I wish I had lost more? Um, of course. But, the weight isn’t everything. Feeling better and being healthier is the REAL goal. Did you miss joining up last week, but want to jump in this week? We’d love to have you.